Heat grill. Alternately thread chicken and vegetables onto six 12 to 14-inch metal skewers. Reserve 1/2 cup vinaigrette in small bowl for dip; brush kabobs with remaining 1/2 cup vinaigrette. Place kabobs on gas grill over medium heat or on charcoal grill 4 to 6 inches from medium coals. Cook 13 to 15 minutes or until chicken is no longer pink in center, turning occasionally. Serve reserved vinaigrette as dipping sauce. 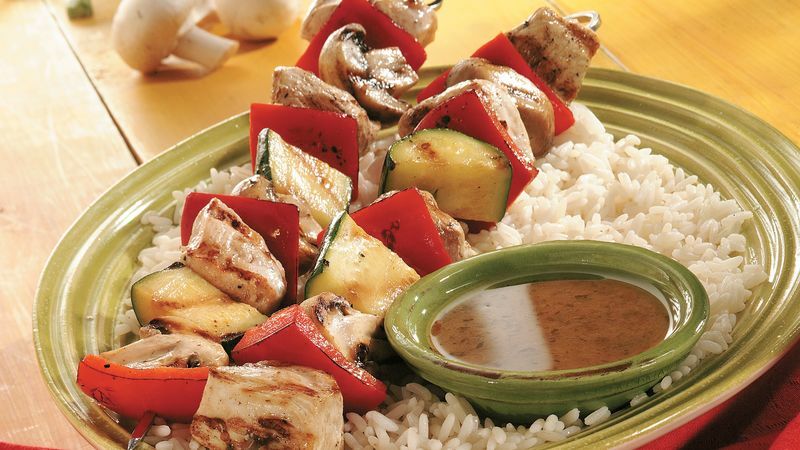 To broil kabobs, place on broiler pan; broil 4 to 6 inches from heat using times above as a guide, turning occasionally.